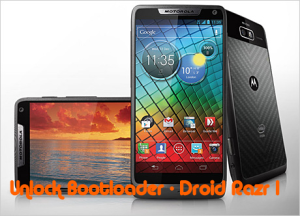 Motorola has recently launched Droid Razr I and now, xda member mattlgroff has introduced a tutorial to unlock bootloader. You can easily unlock bootloader using the AIO Moto Tool as well. This is a one click tool that works with Droid Razr I, so that you can unlock and root the device easily. After unlock bootloader safely you can install custom ROM or recovery as well. Warning: You should clearly understand that you are proceeding with unlocking the Bootloader your device. Further, neither we nor the developer will hold any responsibility if your brick or damage your device. Step 1: This article should only be tried on Motorola Droid Razr I. Step 2: You should charge your device so as to have at least 70% charge with it. This will reduce the chances of Power interruption during the process. Step 3: You should backup all valuable data’s on your phone, so that there is no data loss during the process. Step 4: You should disable all Security programs like Antivirus and Firewall from your computer and uninstall the same from your phone, as these security programs generally tend to interrupt the process. Step 5: Enable USB Debugging in your Asus Transformer Pad TF300T from the path “Settings > Applications > Development > USB debugging”. The option of USB Debugging should be ticked. Download Android SDK and RAZR I Rooting Tool from here to your computer. Install Android SDK onto your device so as to have all necessary drivers for your device. Minimize the command prompt window, do not close it, you’ll need it later. Step 2: Now, go to Motorola’s Official Website and login there through a Motorola or Google account (the account should be the one whose password you remember). Follow all the instructions mentioned here before proceeding. Step 3: On the Motorola website, agree to the terms and conditions and hit “Request Unlock Code”. A code will be emailed to you. Step 4: Next, login to the account you used while going through Motorola’s website. Check for the code sent by Motorola. Replace the “UNQIUE_KEY” with the key you got from Motorola. That’s it! You have successfully unlocked the Bootloader of your Motorola Droid Razr I. Share your views with us, we are here to help you always.